Our unique mat is double sided with red on one side and orange on the other. This revolutionary design allows you to use the side that works best with your fabric colors. The also prolongs the life of your mat. • Yardage numbers on the top and bottom for cutting 1/4yd, 1/3rd, 1/2yd, 2/3yd/, 3/4yd and 1yd. Enjoy these instructional videos from quilter extraordinare Pat Sloan, who didn't just endorse The Cutting EDGE Rulers, she also assisted with heir innovative design. Highest quality self-healing mats can withstand any type of cut. Self-healing technology allows cuts to mend themselves, allowing mat surface to remain smoother longer than standard mats. Double sided so you can use the side that works best with your fabric colors and prolongs the life of your mat. 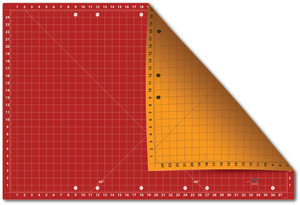 For best results use in conjunction with the Cutting EDGE Rotary Cutter and EDGE Rulers. Gridded surface 25" x 38"